Heavy rains left central Portugal in a state of emergency on October 25, 2006, said news reports. The rains triggered mudslides and floods throughout Portugal and western Spain, but the worst of the damage was near Lisbon, the country’s capital, and the areas immediately to its north. By the time the clouds cleared on October 27, the tributaries of the Tejo (Tagus) River were still swollen with the run-off. 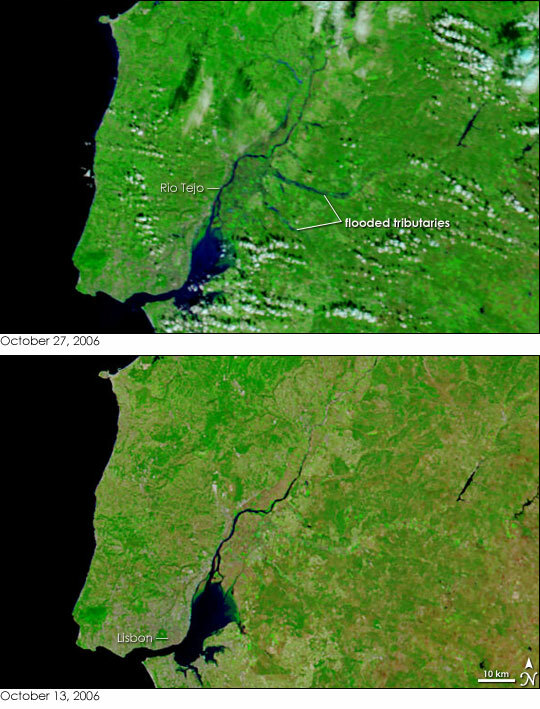 Tainted blue with mud in the top image, the flooded rivers extend both east and west from the Tejo. The Moderate Resolution Imaging Spectroradiometer (MODIS) on NASA’s Terra satellite captured the image on October 27 using both visible and infrared light. In this type of image, water stands out from the surrounding land because of its black color. Sediment in the water, often a sign of recent flooding, can give it a blue color. In the lower image, taken two weeks earlier, the Tejo is black like the Atlantic Ocean to its west, and its tributaries are not visible. Near the lower edge of both images, Lisbon and surrounding cities color the land cement gray. Plant-covered land is bright green, while lightly vegetated land is tan. Patches of freshly burned land along the right side of the lower image are red. In the space of two weeks, the rainfall has clearly spurred plant growth. The landscape has turned green in the top image with the flush of new vegetation. 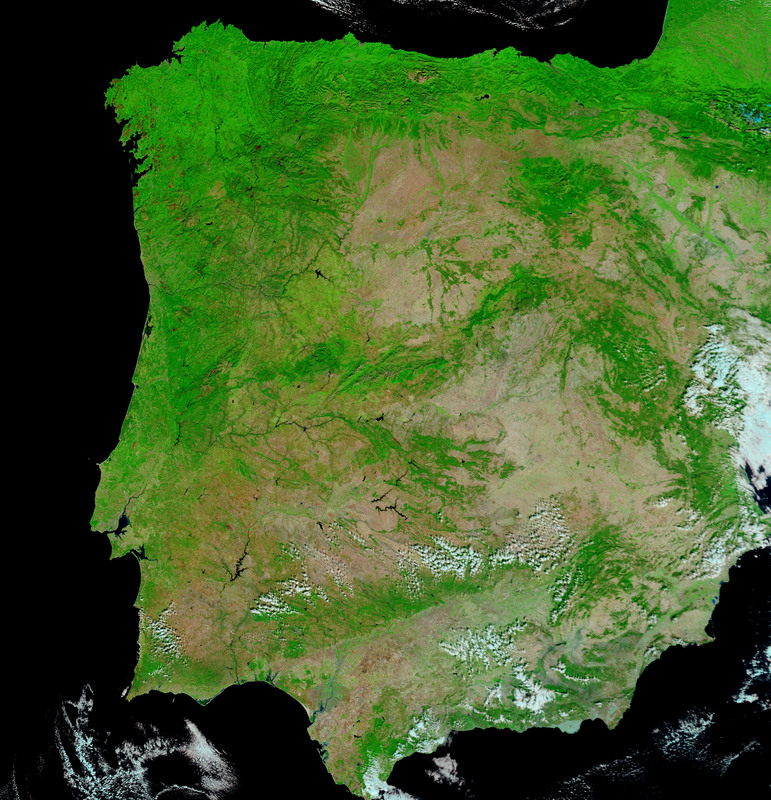 The large images provided above are at MODIS’ maximum resolution of 250 meters per pixel. 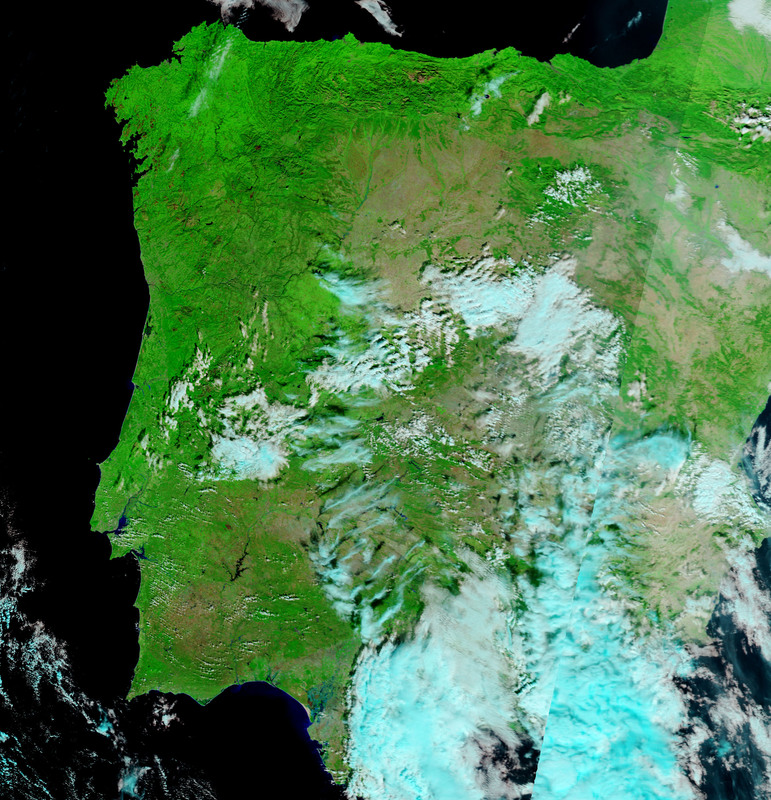 The MODIS Rapid Response Team provides daily images of Portugal in a variety of resolutions. NASA image courtesy the MODIS Rapid Response Team at NASA GSFC.